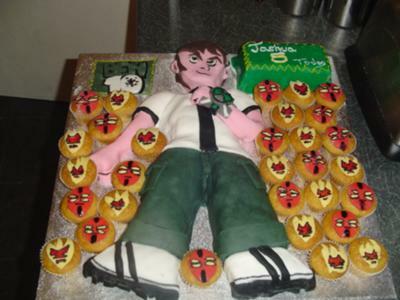 I decided to make a cake in the figure of Ben 10. This was a 20 inch figure which consisted of chocolate sponge cake with a chocolate buttercream filling. I made 2 sponges and filled them with the chocolate buttercream. Then I shaped them to form the Ben 10 figure. After shaping the cake into my Ben 10 figure, I covered the cake in fondant icing or frosting which was coloured in the appropriate colours e.g Green for the pants, white for the T-shirt etc. As the cake was taken to my sons school I decided to make 30 cupcakes or fairycakes so each of his school friends could enjoy it too. On top of the cupcakes I added a face on an alien made from fondant icing which was couloured in either red or yellow and finished with black liquorice colouring. I am one very happy and proud DAD ! This is so COOL....My son would FLIP if he had this cake!!! Your son must be very proud :-) Amazing Job!! Your totally rock!! nothing more needs to be said!! Wow - this is really awesome for your first attempt at making a cake! It is easy to see why your son was so thrilled! Great job and thanks for sharing!